The Graduate College hosted its second annual Knowledge Mobilization Impact Awards highlighting impactful and innovative research conducted by ASU’s graduate students and postdoctoral scholars. 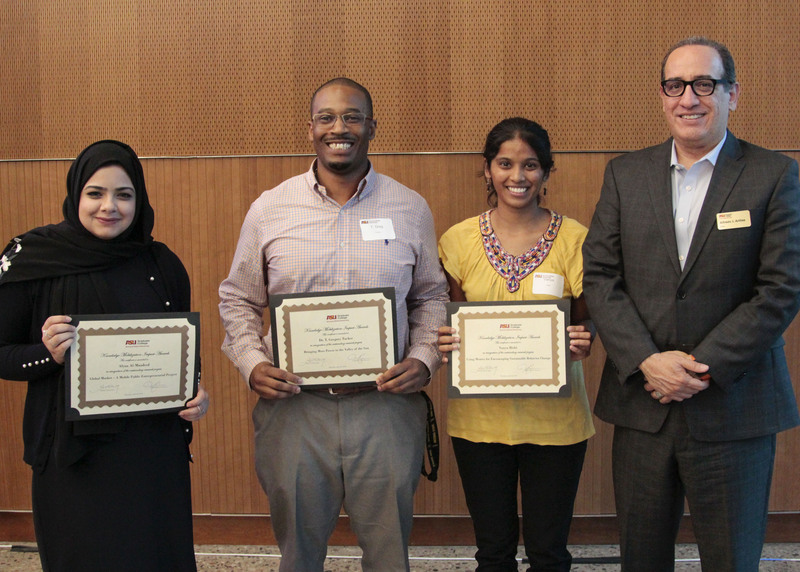 This year’s winners were: Alyaa Al-Maadeed from the School of Social Work in the master’s category; Vanya Bisht from the School for the Future of Innovation in Society in the doctoral category; and T. Gregory Tucker from the School of Molecular Sciences in the postdoctoral category. The Knowledge Mobilization Impact Awards program has grown dramatically since its debut, with nearly five times more applications received than last year. The awards ceremony featured three-minute videos, submitted by this year’s finalists, highlighting an array of high-impact research projects. A video showcasing last year’ participants Jesse Senko and Erica Soltero was also shown, and can be viewed on the Graduate College’s YouTube channel. Participants spanned academic disciplines from STEM fields such as engineering and sustainability to humanities such as social work and education. Presentation topics ranged from increasing the public accessibility of archaeology to encouraging sustainability through social media to the creation of global-local enterprises allowing refugees to gain valuable work skills. Andrew Maynard, director of the ASU Risk Management Lab and professor in the School for the Future of Innovation in Society, presented the keynote address, titled "Humility is not a four-letter word." It can be seen at https://youtu.be/ylN2r-sXsz8. Vanya Bisht, from the School for the Future of Innovation in Society, shows off her award certificate in the doctoral category. Award recipient in the master's category, Alyaa Al-Maadeed from the School of Social Work, has a conversation during networking. Attendees talk to Knowledge Mobilization Studio students about their course projects. Daniel Burillo, graduate research associate in Civil, Environmental and Sustainable Engineering, at Ira A Fulton Schools of Engineering, discussess his project with an attendee. Research projects were reviewed by a panel of interdisciplinary faculty and industry/public sector leaders. The Graduate College awarded winners in the master’s, doctoral and postdoctoral categories travel/research funds in the amounts of $250, $500 and $800, respectively. Maynard delivered a thought-provoking address on how hubris gets in the way of knowledge mobilization. Researchers may lack the ability to translate or apply their research to real-life issues and must exercise humility to mobilize their knowledge across disciplines to make an impact. Maynard provided 10 tips for mobilizing knowledge, which included knowing the target audience and putting them first, using language that makes sense to the audience, and actively listening to others. Greg Tucker, winner of the award in the postdoctoral category, presented "Bringing More Power to the Valley of the Sun," a project he is working on within the School for Molecular Sciences. Presenting his lab’s patented battery and fuel cell research in terms businesses and the general public could easily understand was an opportunity to communicate the technical intellectual property of the work to fellow researchers and local business owners. “Knowledge mobilization is an efficient vehicle for individuals or teams to effectively relate their specific idea to another group for implementation,” Tucker noted. By highlighting the importance of the technology in an easily accessible way, Tucker hopes to inspire a new generation of students and local scientists to adapt the technology to create new energy solutions for the Valley. Vanya Bisht, award recipient at the doctoral level found knowledge mobilization to be an effective tool for social change at the local level — starting with her friends — for her project, "Using Memes for Encouraging Sustainable Behavior Change." Empowerment and action-based outcomes are an important element to knowledge mobilization to Alyaa al-Maadeed, recipient of the award in the master’s category. Presenting her proposal for "Global Market: A Mobile Public Entrepreneurial Project," she was encouraged to see so many projects aimed at creating social solutions. With the award funding further development of her research project, she looks forward to taking her work into the community, working with communities and stakeholders to leverage her platform in ways to genuinely impact them. For more information about the Graduate College’s knowledge mobilization efforts, visit graduate.asu.edu/professional-development/knowledge-mobilization.